I’m snowed in today. I’ve always loved snow days. The world slows down a bit, gets quiet. Snow days always mean baking for me. A few days ago, I mentioned on twitter I wasn’t sure what to bake next. If you’re ever out of ideas, turn to twitter, seriously, crowd-sourcing is the way to go. 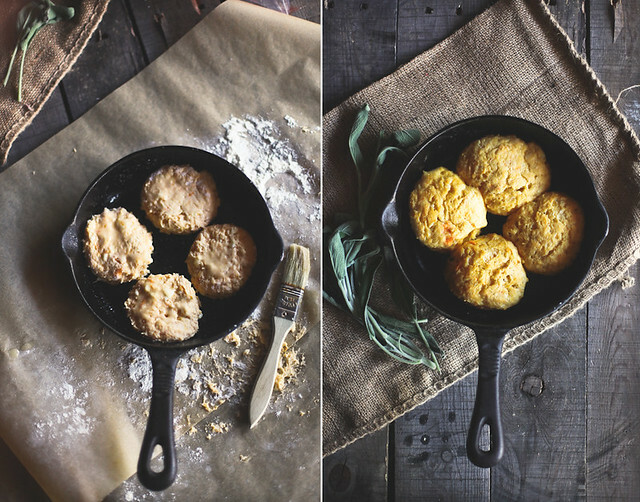 I got lots of suggestions, but sweet potato biscuits grabbed my attention (thanks, tim!). I love sweet potatoes - probably more than your average person. I have them several times a week, in every different form, baked, roasted, as fries, I should have probably turned orange by now, but I’d never tried sweet potato biscuits before. The biscuits are very mellow in flavor, and just a touch sweet. They go really well with the savory & flavorful caramelized shallot and sage butter I threw together. What also would go great with these biscuits are the goodies in Eat Boutique's breakfast box. A couple of months ago, Maggie, the owner, asked me if I’d like to host a giveaway and I jumped at the opportunity to share this business with you. I’ve been a huge fan of Eat Boutique since it’s creation and I’ve loved watching it grow. It’s simple. Just leave a comment here saying you'd like to be entered (I'll only count the ones that mention they'd like to be entered, since this is a US only giveaway. If you're not from the US but you'd like to comment anyway, feel free. ;). Enter a second time by becoming a fan of Eat Boutique on Facebook, come back here and leave another comment saying you’ve done so. 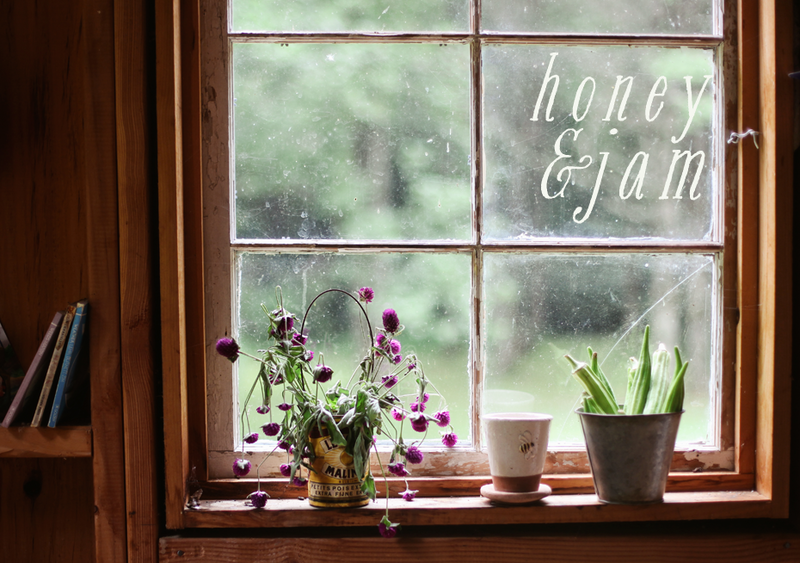 Enter a third time by tweeting about this giveaway (be sure to include @honeyandjam and @eatboutique) and leave another comment saying you’ve done so. No entries after 11 pm EST this Sunday, January 8th. US residents only. Winner will be picked at random and announced the 9th. Make the dough: In a large bowl, whisk together flour, sugar, baking powder, salt, and baking soda. With a pastry blender or two knives, cut in butter until mixture resembles coarse meal, with some pea-sized lumps of butter remaining. In a small bowl, whisk together sweet potato puree and buttermilk; stir quickly into flour mixture until combined (do not overmix). Shape the biscuits: Turn out dough onto a lightly floured surface, and knead very gently until dough comes together but is still slightly lumpy, five or six times. (If dough is too sticky, work in up to 1/4 cup additional flour.) Shape into a disk, and pat to an even 1-inch thickness. With a floured 2-inch biscuit cutter, cut out biscuits as close together as possible. Gather together scraps, and repeat to cut out more biscuits (do not reuse scraps more than once). Bake the biscuits: Preheat oven to 425 degrees, with rack on lower shelf. Butter an 8-inch cake pan. Arrange biscuits snugly in pan (to help them stay upright). Brush with melted butter. Bake until golden, rotating once, 20 to 24 minutes. Heat 1 tablespoon of olive oil in a small saucepan, over low heat. Add the shallot and cook until brown & soft. Let it cool completely. In the bowl of an electric mixer, or by hand, beat the butter, shallot, sage and salt until combined. You can place this mixture in a bowl, or scrape the butter onto a piece of plastic wrap, mold into a log shape and refrigerate. The giveaway is now closed. Jacqui has won! Congrats Jacqui, your package is on its way! DAMN these look good, but they are so not on my plan right now. darn carbs. would love to enter the giveaway. i never win, but might as well give it a shot. happy new year hannah! The biscuits look delicious, and I love any opportunity to use sage. Please enter me in the contest (breakfast is my favorite), thanks! The biscuits look amazing, and so do your pictures! I'd love to be entered. Best wishes to you. I'd like to be entered! I'm so glad to know about Eat Boutique - lots of birthdays coming up! Thanks. And um, sweet potato bicuits? Yes, please! Anytime! Mmm! Tweeted :) or rather, re-tweeted...whatever. Oh I'd love to be entered! I'm a fan of Eat Boutique on Facebook! I would like to be entered! That looks so amazing! I would like to enter for the giveaway! And those biscuits look so good! I liked Eat Boutique on Facebook too! I would like to enter! Thanks so much for the chance! I would like to be entered! These biscuits look awesome! Yum. I love sweet potatoes. These look so delicious! I would love to be entered in the giveaway. Thank you!! I would like to be entered! This looks like so much fun! These look so good Hannah! Oh a breakfast box would be so lovely! I would like to be entered. I would love to be entered - what could be better than a warm, cozy breakfast when it's cold and dreary outside?! Thanks for the giveaway! Those look delicious and I would love to be entered! Lovely! I'll be trying this recipe. Thanks for entering me into the giveaway! "liked" eat boutique, everyone else should too! sparkling jam cocktails... lovely! I liked them on facebook as well! They have lovely gift packages! I love sweet potatoes and sweet potato biscuits are a must at family functions. Yours look so yummy! Gorgeous photos. I would love to be entered to win this giveaway. hannah! those look insane. I too, love a good sweet potato. I am a fan of maggie's as well. She has a great product and is a very hard worker. Would love to be entered in the giveaway, thank you!! I would say that you don't need to enter me because I've already have a ton of things from Eat Boutique. But I'm going to be selfish and enter anyway (and will promote the heck out of this giveaway too). These biscuits, by the way, look fabulous! I would love to be entered in the Eat Boutique giveaway. I'm a huge fan of theirs!! I'd love to be entered! This is fantastic! I've also "liked" Eat Boutique on facebook! I would love to be entered! Gorgeous biscuits! Oooh so tasty. I'd love to be entered! Oh my, these sound delicious! I'm a big sweet potato fan too. I would love to be entered in the giveaway. I like Eat Boutique on Facebook! those look delicious! i love sweet potatoes. gorgeous pictures. i definitely want to be entered in the giveaway! The biscuits look so good! I'd love to be entered in the giveaway! I would love to be entered! What a wonderful giveaway. I'm already a fan of Eat Boutique on Facebook which is how I found you! I would love to be entered in this contest! Breakfast is the bomb! And so is ANYTHING with sage! I'm sort of obsessive when it comes to your photos and these are no exception. Keep at it girl! These look wonderful! Please enter me in the contest. I'd love to enter and I liked them on FB. 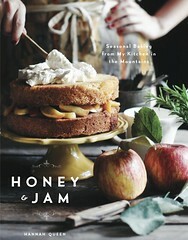 I'm so happy when I see an update from honey & jam cause I know I'll be seeing your beautiful photos an reading a delicious recipe too! I "liked" them for another entry. I'm already a fan of Eat Boutique on FB. I'd love to be entered! Those biscuits look delicious. I'd love to be entered into the giveaway and I am a huge fan of sweet potato biscuits! I feel the same way about sweet potatoes! After leaving my mothers kitchen where we only had yams out of a can on thanksgiving I can't seem to get enough of the real stuff! So thanks for posting this, I'm definitely going to try these! Please enter me in the giveaway! I always end up buying too many sweet potatoes, so now I have a plan for the extras! Also tweeted to be entered in the giveaway! i'd love t be entered... looks DELISH! These look fabulous. I love anything I can do with sweet potatoes. I'd love to be entered also. Thanks for the opportunity. Pretty biscuits .. so scone like. Happy New Year Hannah! I would love to enter the giveaway! Thank you so much for hosting it. Oh, and those pictures are so stunning (as usual!). yum :) I would like to be entered! I would like to be entered into the giveaway! I'm a facebook fan of Eat Boutique! okay first of all i'm drooling from this recipe and am pinning it to try it asap! secondly, i would love to be entered in the giveaway! i liked Eat Boutique on facebook from both my personal page and Order in the Kitchen's page! Sounds intriguing, I would like to be entered. I have made those biscuits a couple times, very popular at my house - all biscuits actually. I would love to be entered too. Breakfast is my favorite meal! Sounds amazing! Please enter me! Here's my entry! This seems so great! I've also just liked the Eat Boutique on FB. Now I'm off to tweet! I also became a fan of Facebook! What Foodie wouldn't want to be entered in this giveaway! Please enter me...I'll be pinning your biscuit recipe too...thanks. these look delicious Hannah! 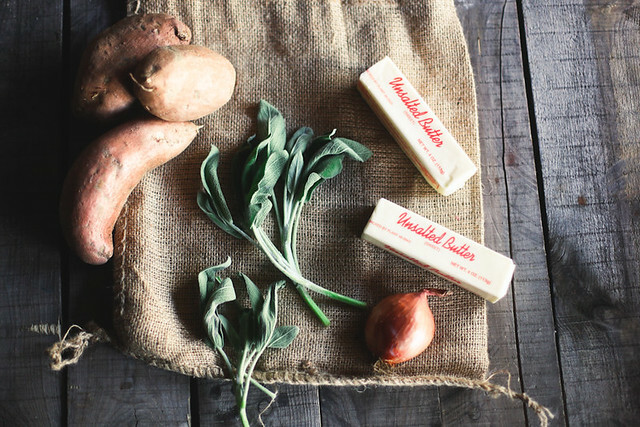 I am loving the idea of that sage/shallot butter...sage is one of my favorite herbs. I'd love to be entered in this giveaway, who doesn't love breakfast goods?! I'd like to be entered. These biscuits look delicious. As a fellow sweet potato lover I know I'm going to have to give them a try. Wishing you all the best for the New Year! Mmm....a gift basket of artisnal goodies would be welcome here! Yummy biscuits! I would like to be entered! I eat sweet potatoes several times a week too! Love 'em! Can't wait to try this. what an amazing giveaway!!! and the recipe as too... crossing my finger to win!!! Sweet potatoes are so delicious! I would love to be entered! I was drooling over the biscuits so much I didn't even notice there was a giveaway until I scrolled down. Like you, I am an adamant lover of all manners of sweet potatoes, and I'm excited to eat these soon. I would also love to be entered in the giveaway. I liked Eat Boutique on facebook. Thanks! These biscuits sound just right! I'm a big sweet potato lover too! Especially this time of year. You must try sweet potato in cinnamon rolls too, so good! And I'd love to be entered in your giveaway, what a cute company! Just twittered it! Thanks so much Hannah! you have THE coziest food. sweet potatoes and biscuits together! how wonderful!! Ok, these sound so delicious! Wonderful photos as usual :) I'd like to be entered for the Eat Boutique giveaway! Thanks! I tweeted and want to be entered! The biscuits look amazing... 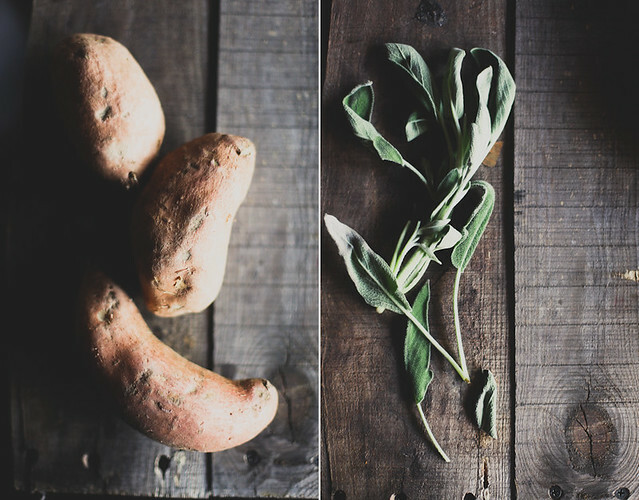 I love the combination of sweet potato and sage, but I've never tried sweet potato biscuits. I need to remedy that soon. I would love to be entered in the give away. It sounds luscious! Ooh, and I just liked Eat Boutique on facebook. And I just liked Eat Boutique on Facebook too. I love to enter give aways...please enter me! I just liked them on FB, please enter me again! thanks! Please enter me in your giveaway. Thanks for the great recipes & photos! I'm going to make those biscuits this weekend. I just liked Eat Boutique on facebook. Thanks for entering me! I "liked" Eat Boutique on Facebook ... thank you for the second entry! I want to enter! These look fantastic!! I love sweet potato biscuits. They are such a good way to switch things up. And, I'd like to be entered please. That basket looks delightful! Hello. I would like to be entered as well! Sweet potatoes are one of my favorite foods. I am keeping this recipe to try it soon. I would like to enter! Thanks! I liked them on FB. May I have another entry? Hey there, great photos! sounds yummy, and Yes, I would like to be entered to win...many thanks! and Yes, I have now liked Eat Boutique on facebook, yea! I would love to be entered. We can't get enough sweet potatoes either, especially biscuits! Anything in biscuit form is pretty perfect though..
Ah, and now I've tweeted. WOW! 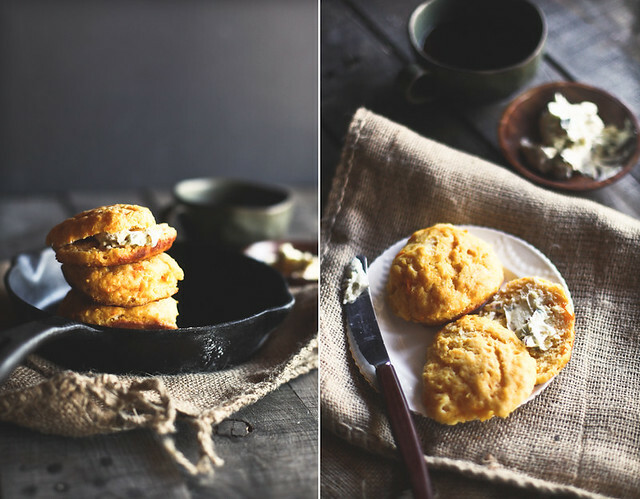 Those sweet potato biscuits look divine. Perfect for snowed in days! I used to enjoy baking. I am not such a big fan of doing it myself. However, your passion for cooking has sparked inspiration into me and I am going to start cooking again! Thank you! I liked them on facebook also! I'd love to be entered to win the Breakfast box. The breakfast box sounds amazing and I'm sure so are the biscuits and butter. I made pumpkin biscuits and the same butter for a Kerrygold contest recently where we were asked to develop a compound butter for them...it is decadent and delicious. Oh, sage butter is my favorite thing with simple ravioli. Is for sure lovely with biscuits as well. Gorgeous work, one again! Count me in too for the giveaway. The box sounds delish! Please enter me in the giveaway. I've had Martha's sweet potato biscuits before. Can't wait to try with caramelized shallot and sage butter! Happy New Year! This sounds delicious. Thanks for sharing. Happy New Year! I became a fan of Eat Botique on FB. Love how you made these in the skillet!! These biscuits look great! I would love to be entered to win the breakfast box. Those biscuits look amazing! We have had hardly any snow which is a good thing but I do sorta miss snow days! I would liked to be entered in the contest! I'm always in awe of your photos Hannah! This would be so fun to win. :) Thanks for the chance. I would love to be entered for the giveaway! And I've never made sweet potato biscuits, either. I better fix that soon! I would LOVE to win this - the box looks amazing! Just became a Fan of both on Facebook! These look amazing! I can't wait to try. Please enter me in the contest! I just became a fan of Eat Boutique on Facebook, please enter me again! ....and, I tweeted about it. thanks for the great giveaway! I would love to be entered. Sounds delicious! These look delicious! Thanks for sharing the recipe! But of course I'd love to win the breakfast box! Tweeted the giveaway as well (@squirrelbread). I like Eat Boutique on facebook. I just "liked" eat boutique on facebook! Yay! Yum! I would like to enter--that breakfast box looks delicious. I would also like to go home and make some sweet potato biscuits. I just "liked" Eat Boutique on Facebook. Enter me please! your pictures never fail to make me drool!